Thermocouple temperature measurement sensors have been manufactured by TMS Europe in the UK for over 30 years. Our thermocouples are used in a wide range of industries and applications around the world. We stock a large range of standard and proprietary temperature probes, which can be ordered online on the TMS Webshop. 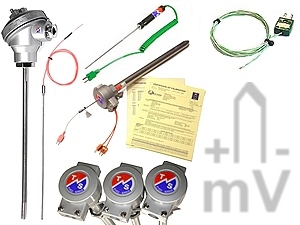 Our standard thermocouple constructions, listed below, can be varied according to your needs (e.g. to a specific length) and manufactured in any quantity. We also can design, develop and manufacture new custom thermocouple assemblies to your individual application requirements. We can supply our thermocouples calibrated, as we are a UKAS ISO 17025 accredited calibration laboratory, giving you certified assurance of our thermocouples’ accuracy. With our instrumentation and ancillaries, we can provide a complete temperature measurement solution with certified accuracy, including everything between the tip of the probe and your recorded data. 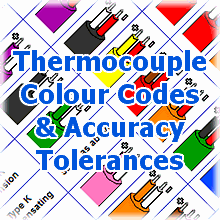 If you need help determining which Thermocouple Type is right for your temperature range and application, see our Thermocouple Colour Codes & Tolerances information page. Mineral insulated thermocouples consist of a seamless metal sheath, which contains the thermocouple conductors; the conductors are embedded in a highly compacted magnesium oxide powder. Our noble metal thermocouples are intended for use in critical high temperature applications that exceed the limits of metal-sheathed thermocouples. Noble metal thermocouples types, including Type R, Type S and Type B, have conductors made using precious metals such as platinum. A wide range of UKAS calibrated thermocouples for use in the aerospace, automotive and other industries working to the AMS 2750E specification on heat treatment of materials.